Beautiful St. Michael Mission, founded by St. Katharine Drexel in 1898, is a tranquil oasis in the chapter that houses the Navajo Nation’s busy capital, Window Rock. The mission was once the hub of the community. At one time, say the people here, there was no window in the Window Rock. It was simply a big wall of stone. At the foot of this stone wall lay coiled a huge, deadly serpent. It made its lair there because a certain plant grew there that it liked to eat. You can still find it today if you know where to look. The Wind grew tired of watching the serpent tyrannize the people and decided to help them. It blew very hard in the center of the wall until it blew a round hole in the rock, big enough for the people to drive the enormous snake through. It’s an apt metaphor for the thriving, largely urban chapter of St. Michaels, which contains Window Rock. If the chapter can just punch through the wall of bureaucracy, it’s poised to take off like the wind. “We’re getting there,” said Chapter President Curran Hannon. More than any other chapter, with the possible exceptions of Shiprock and To’ Nanees Dizi, St. Michaels would benefit from certification. The chapter contains two hotels, multiple restaurants, two grocery stores, several service stations, a thriving daily flea market and a host of small businesses, not to mention offices of every single tribal bureaucracy, since it houses the Nation’s capital. If it could collect local taxes, there’s no end of things it might do. 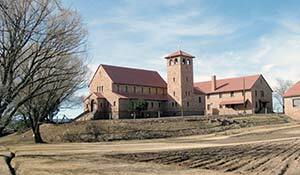 Name: Named for the Catholic mission of St. Michael, established by St. Katharine Drexel in 1898. The Navajo name for this area is Ts'ihootso, "Green Meadow." Population: 5,643 at the last Census; chapter officials estimate the population during the day, when all the tribal employees are here, at 20,000. Issues: Nobody knows the chapter is the chapter of Window Rock; the current administration is debating changing the name to Window Rock Chapter. With people coming in from all over the Nation to work here, there is tension between the newcomers and native ranchers who are being edged out by development. Assets: One of the few chapters with plenty of employment opportunities, public and private, and good development potential once the chapter gets certified. Upcoming events: The chapter is hosting a college fair, with entertainment by James and Ernie and others, on March 19. To read full story, pick up a Navajo Times at your closest newsstand or subscribe online.